Tesla's Ambitions Run Into The Realities Of Making Cars : All Tech Considered Tesla, which has roots in the tech world, is facing the challenge of becoming a successful car company amid scrutiny over its Autopilot technology. 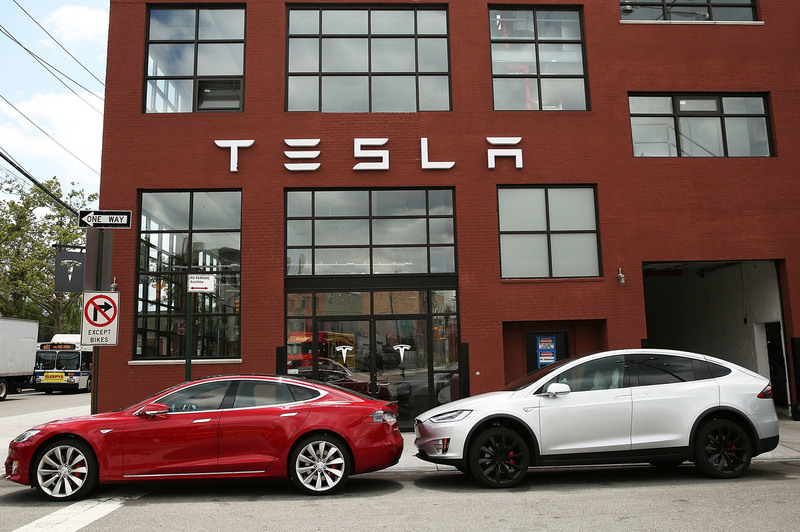 Tesla vehicles sit parked outside a new Tesla showroom and service center in Brooklyn, New York on July 5. The electric car company has come under increasing scrutiny following a crash of one of its electric cars while using the controversial Autopilot feature. The auto industry is watching to see whether Tesla, which has its roots in the tech world of Silicon Valley, can pull off its goal of mass producing cars. The goal hit a road bump in May when Tesla had its first fatality in a vehicle using Autopilot, a feature it offers that allows the car to do a lot of the driving. It's supposed to be an assist. Before you engage it, it warns you not to take your hands off the wheel. "Well, I think it is to be expected that people are going to do things that they've been told not to do with new technology," says John Dolan with the Robotics Institute at Carnegie Mellon. "There were stories years ago about people using lawn mowers to clip their hedges and cutting their fingers off, things like that. There's a legitimate question as to whether or not Tesla did it too early. It's also possible that the traditional automakers would wait until too late to bring a technology out." People get killed every day in regular cars, so why all the attention over this one fatality? Because it involves a technology that's expected to revolutionize the industry — and Tesla has been way out front. "The way Tesla has handled Autopilot, which is sort of in beta testing out in the real world, is not something that a traditional automaker would do," says Michelle Krebs, a senior analyst with AutoTrader.com. Krebs says the stakes for Tesla are different. For example, Tesla CEO Elon Musk recently came out with the second part of his master plan for the company. He wrote on the company's blog about getting into trucking and ride sharing at some point in the future. The way Tesla has handled Autopilot, which is sort of in beta testing out in the real world, is not something that a traditional automaker would do. In the day leading up to the plan's release, much of the car world waited with breathless anticipation. "First I can't imagine that with one of the traditional automakers, and then I can't imagine the traditional automakers announcing something that was almost dreamy," Krebs says. The new plan — which is short on details — involves building batteries, installing them, moving beyond passenger vehicles. Krebs says Tesla hasn't yet proved it can execute on its old plan to build an affordable electric car for the masses. "It's very hard to build a car at all and they have been doing largely hand building of cars. Tesla has not yet done mass production, and mass production is very challenging," she says. Ryan Popple, a former Tesla executive who now runs an electric bus company called Proterra, says Musk is up to the challenge. "If anybody can run a rocket company and a car company and maybe a solar company as well, it's Elon," he says. "You have a limited amount of resources every 24 hours that you can put into projects. What's going to be really important is for Tesla to pick what's most important to advancing their clean vehicle revolution or their clean energy revolution and then do nothing else." Advocates in the electric car world say they almost need Tesla to succeed — the same for self-driving cars. Right now a setback for Tesla could mean a setback for both technologies.